Much has happened in the Cubs Universe since we last talked, a one end-zoned football game was played at Wrigley Field, Hoffpauir is turning Japanese, Rothschild is turning evil empire, Ryno is going to the Pigs (Class AAA Lehigh Valley Iron Pigs), and proposition 420 passed here in AZ. With Micah Hoffpauir playing for the Hokkaido Ham-Fighters in Japan this coming season. my “turning Japanese” reference is a nod to the 1980’s song ‘Turning Japanese’ by the Vapors. Also in case you were curious the name/mascot Ham-Fighters is what happens when your team is purchased by a meatpacking company named Nippon Ham. Ahh, the useless knowledge you can learn here at BOS. I’m going to pass over the uni-endzone game and Larry leaving and talk about Ryno going to the Pigs. 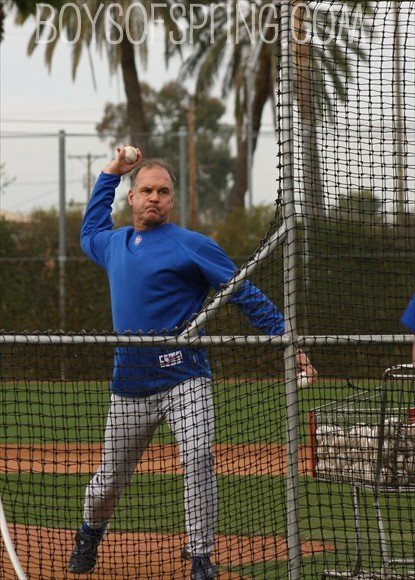 Kidding aside, Hall of Fame Cub Ryne Sandberg is going to be missed, he’s been a major asset to the organization as a player, coach, and manager. After retiring as a player following the 1997 season Ryne wasn’t sure what he wanted to do and took some time away from baseball to spend with his family. He soon gravitated back to the game he loved, first helping out as a Cubs spring training instructor and eventually deciding he had interest in managing. Sandberg did it the right way working his way up the minor league managerial ladder from single A to being named Pacific Coast League Manager of the Year at Class AAA Iowa. Many thought with Lou Piniella retiring last season that 2011 would be a perfect time for Ryne to step up to the big leagues and manage the Cubs. However, following a successful interim stint at the end of last season the Cubs picked Mike Quade as manager and gave him a two year contract (with a third year vesting option based on performance). When that happened Ryno waited to see what the Cubs might offer, after four days and no offer he decided to leave the organization. Under the circumstances Sandberg thought it best for the Cubs not to have him manage again at AAA Iowa and said, “I didn’t think it would be fair to everybody involved, including the fans and the new manager, Mike Quade, with the perception of me waiting for something to go wrong or for the axe to fall in Chicago. With that being said, I wish Mike Quade and the ownership of the Cubs the best of luck”. Sandberg soon accepted another AAA managerial job but this one in the Phillies organization where he started out his career before being traded to the Cubs in January of 1982. Ryno has been a fixture with the Cubs for so long not seeing him at Fitch and Hohokam this spring is going to feel a little weird. Good luck Ryno! I’m sure it was a difficult choice trying to pick between a Cubs legend in Ryno and Quade who guided the team to a 24-13 record last season after taking over. Quade has more than paid his dues managing 17 season in the minors, including 2003-2006 for the Iowa Cubs in AAA. 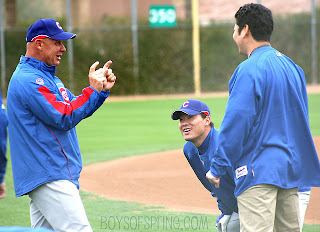 From what I’ve seen of Quade since he came on board as Cubs third base coach in 2007 is that he communicates well with players, has their respect, and knows the game. He also has a great sense of humor although that may be tempered in his new position. Having managed in the Cubs minor league system he should also have a good feel for the young talent. 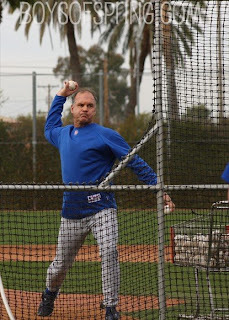 I think Mike Quade will do a fine job for the Cubs but whether he has or will be given the talent to be competitive is another question altogether. Shortly after my last blog we found out the Mesa voters passed Proposition 420, paving the way to fund a new Cubs spring training complex. The new complex will most likely be built at the Mesa Riverview site and will break ground late in 2011, my guess is it will be ready for spring 2014. After the Cubs opt-out lease is up following spring training 2012 they have the option of going year to year at Hohokam until the new complex is ready (you can see artist renderings of the proposed complex on my October 5 blog below). The Cubs will likely release their tentative Spring Training schedule tomorrow but we have been able to piece together much of it already. I’ve been told the final game on March 30 will be a charity fund raiser and may start at 12:05. The schedule below will give the Cubs 18 home games at Hohokam this spring. I’ll fill in any missing or incorrect games as soon as the Cubs release the schedule (including the Las Vegas dates). A Kris Bryant HR at Cubs Park in Mesa, gave the fans something to get excited about.